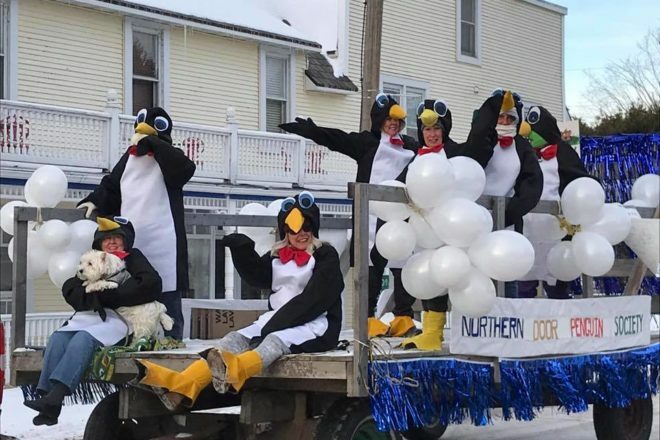 Members of the Northern Door Penguin Society enjoy the ride on their float during the Groundhog Day Parade in Ellison Bay. Photo courtesy of the Ellison Bay Service Club. The eighth annual Ellison Bay Groundhog Day Parade will be held Feb. 2 at 4 pm. Everyone is invited to build a float, decorate a car or walk a dog for the parade. Participants should meet at Nicolet Bank at 3:15 pm. The parade route goes through Ellison Bay and ends at the Mink River Basin, where free “groundhog” stew will be served.